Wood FIG Rings - 1.11"
A set of American-made Rogue Wood Rings provides a solid foundation for gymnastic strength building and beginner-to-advanced suspension training. With a textured, grip-friendly surface that works with or without chalk, wood rings have a distinct, natural feel preferred by many athletes. Rogue Wood Rings are also easy to adjust and built with American craftsmanship for lasting durability and comfort. A set of rings provide a full suspension training system for bodyweight fitness with true gymnastic capabilities. More challenging than a pull-up bar, gym rings can dramatically improve any athlete’s upper body and core strength, while training better joint alignment and overall balance. 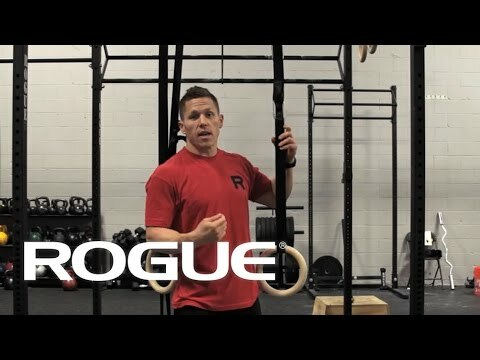 Rogue Wood Rings are scalable for non-gymnasts but built to Olympic quality to handle ring dips, muscle-ups, back levers, front levers, pull-ups, dips, ring push ups, ring rows, and anything else you can throw at them. Rogue produces both a 1.25” diameter wood ring (as used in CrossFit events) and a 1.11” diameter ring built to FIG specifications (FIG = International Gymnastics Federation). The 1.25” ring is fatter and thus more challenging. Fatter grips are better for developing grip strength. FIG sizing can be easier to grip or false grip and is the standard for gymnastic competitions. Rogue's Wood Gymnastic Rings offer athletes a texture, grip, and light feel thoroughly distinct from that of steel or plastic. Wood is often the best choice for indoor setups. Precision machined in Columbus, Ohio, using quality Baltic birch, the gripping surface on each ring has a natural stick that’s great for holding chalk—or for sustaining a firm grip without it. Wood rings are the standard in competitive gymnastics for generations, and our 21st century version has been battle tested for years at the CrossFit Games. To help you get the most out of your new ring set, Rogue offers a variety of additional accessories (sold separately), including extra Competition Ring Straps, the ceiling-mounted Rogue Ring Hanger, the MIL Ring Pouch for safe storage, and the Rogue Rings Door Strap accessory for creating a suspension training station in your home or office. Whether you order a single set of Rogue Wood Rings for your garage gym or multiple sets for a large facility, all orders placed by 3PM ship the same day when products are in stock. The Rogue Shipping System allows you to track your order from the time you place it to the time it hits your door. Order today, track today. *Rogue Wood Rings are designed for indoor or outdoor use when weather permits. Wood rings should never be stored outdoors or used in the rain. This wood item carries a 2 year warranty. Ring Straps are a consumable product and carry a 1 year warranty. Rogue Gymnastic Wood Rings is rated 4.9 out of 5 by 76. Rated 5 out of 5 by Rockfellow from Excellent tool for full body strength and fitness I purchased the rings last month and use them for Dips, Push-Ups, Body Weight Squats, Body Weight Rows, & Pull-Ups. The wood rings have a great feel to them and the exercises are complimentary to my weightlifting program. They are fun to use & versatile. Rated 5 out of 5 by Jokast from Nice product I’m extremely satisfied with this product. The only negative to the rings is that the Rogue logo on the straps wear off pretty easily. Rated 5 out of 5 by sencarn from Fantastic Quality and Superior Durability I bought the Rogue Gymnastic Wood Rings after trying both plastic and metal rings and they are by far the better choice. The quality of the wood used is excellent in both feel and aesthetics. The straps are very strong and there is plenty of slack provided. If anyone has any doubts, go with the Rogue wood rings, you will not be disappointed. Rated 5 out of 5 by Nate259 from Great rings Very good equipment. Love the portability of these rings and the sturdiness of these give me the confidence to do exercises that I never thought possible. Love Love Love them! Rated 5 out of 5 by jddroste from Solid First Go at it with rings. I have it hanging from a P-6V Pull up Bar and have plenty of strap. May purchase a ring attachment for the ceiling to be able to swing from in the future. no need for the strap length if hanging from a pull up bar. Rated 4 out of 5 by Doglover from If only I were stronger..... The rings and straps are well engineered and built. The only thing I'm not crazy about is that any time you make an adjustment to the height of the rings with the straps, it takes a while to adjust to level. I've found I lack the strength to do a lot of what this product is capable of allowing you to do, but nonetheless, rings are a unique piece of equipment in your arsenal and for the price, worth it even for people like me. Rated 5 out of 5 by Tom F from Great build quality Been using the wood rings for about a month and they've exceeded expectations. The build quality is excellent and the wood ring is definitely the way to go.